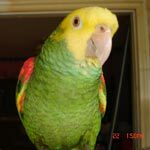 Parrot Forum • View topic - Almonds! I let Rainbow and Myrtle pick their own pistachio out of a jar every morning before I fix their breakfast. I let them pick their own almond in the shell before bedtime. If they need a snack in the afternoon they get a forth of a walnut. I limit their seed to be able to do this. They like picking their own from the jar.